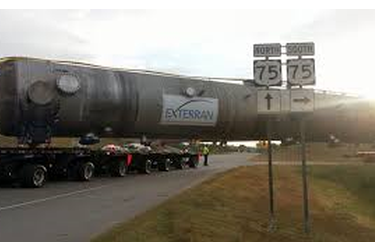 The transport of what is thought to be Oklahoma’s largest oversized load ever has completed day one of its journey. The 186-foot long demethanizer is making its way from Exterran in Broken Arrow to a gas processing plant in Fort Lupton, Colorado. The 536,600-pound object is being moved on a specially designed trailer pulled by two trucks in front and pushed by two trucks in back. The demethanizer left Broken Arrow early Saturday, slowly made its way through Bixby and is now stopped for the night on an on ramp to U.S. Highway 75 in Glenpool. A company spokesman said they will have to travel against opposing traffic on Highway 75 to make the exit onto Highway 117 towards Sapulpa. ODOT has requested they make that part of the journey between 7 and 9 a.m. Sunday to have the least impact on traffic. Crowds have been turning out to see the huge load make its way through the Tulsa metro area. “There was definitely a lot more viewers than we normally see whenever we’re moving something,” said Johnny Mefferd of Northwest Logistics, the company behind the move. He said his crews welcomed the sightseers. The demethanizer will pass Glenpool, Sapulpa, Mannford, and Cushing before going around Enid and through Woodward. Mefferd said they expect to spend Sunday night west of Cushing. The traffic signal at 9th and News Orleans in Broken Arrow was disabled, and the intersection of Highway 51 and East Houston was closed early Saturday morning. In other areas, crews had to take down power lines temporarily to make way for the huge load. The whole set up is 427 feet long and weigh more than 1.1 million pounds. It will exit Oklahoma at Liberal, Kansas as it makes its way to Colorado. Weather permitting, the move should take about two weeks. It took 44 weeks and more than 100 employees to build the tower.